al público a las 18:30h. The 12th European Social Science History Conference will take place from 4 until 7 April 2018 at Queen’s University in Belfast. The ESSHC, organized by the International Institute of Social History, aims at bringing together scholars interested in explaining historical phenomena using the methods of the social sciences. The conference is characterized by a lively exchange in many small groups, rather than by formal plenary sessions. The conference is organized in a large number of networks covering all periods and a wide range of systematic fields. The Women and Gender Network is one of the largest networks of the ESSHC. It addresses gender as a historically and culturally variable category that is constitutive of classifying and interpreting the world, of organizing social and power relations, of producing knowledge (such as historical knowledge), and of shaping experiences of women and men in the past. The Women and Gender network is welcoming research that is crossing epochs, regions, and disciplines. A specific theme is chosen for every conference. As society and history are changing, also gender history meets new challenges. Information flows, digitalization and globalization pose new demands to the understanding, conceptualizing and presentation of gender history. We particularly invite sessions and papers which discuss the ways of writing and presenting women and gender history today, give insight in the finding and interpretation of sources, reflect on the preservation of and access to sources, reflect on theories and discuss the recent critical, challenging potential of women and gender perspectives. Of course this discussion cannot do without empirical research. We are inviting session proposals which include four papers on a specific theme, a chair and a discussant / commentator. However, single papers are also welcome; the network chairs will assemble papers to sessions, or allocate them to an appropriate session. Sessions take two hours, with oral presentations and a comment of ca. 15 minutes; half an hour minimum is reserved for a plenary discussion. The conference language is English. Ideally, sessions include a mix of countries, and certainly a mix of universities. We particularly welcome proposals for comparative and / or inter-disciplinary sessions. If you propose a session, please note that all the participants in the session need to be registered with their name, e-mail address, and in their role as an author with their paper title and abstract. Each participant is only allowed to present one paper. However, the roles of the session organizer, session chair and discussant can be fulfilled by the same or by different persons. We also encourage other forms of presentations, e.g. Meet the Authors-sessions, round table sessions, or a film or work of art presented by the author and discussed by the audience. Please (pre-)register before 1st May 2017 latest via the electronic pre-registration form on the ESSHC website: https://esshc.socialhistory.org/registrationinfo. Please note that the ESSHC is not able to fund travel costs or subsistence expenses. Every participant will have to pay a conference fee. However, there will be discounts for PhD students. We are very much looking forward to your proposals. 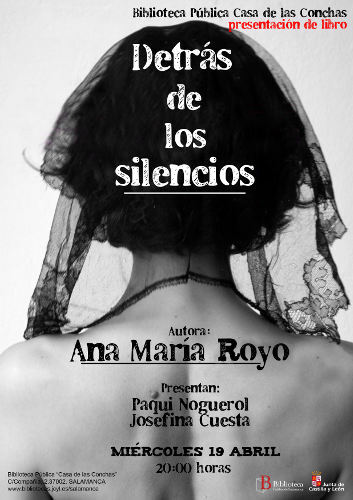 Presentación del libro Detrás de los silencios de Ana María Royo. Presentan el acto Paqui Nogerol y Josefina Cuesta.